Banana does double duty as an egg replacer while adding sweetness and a touch of flavor to this vegan zucchini bread that’s also bursting with juicy raisins, crunchy walnuts and cinnamony sweetness! I’m a little early for zucchini this year, but I want to be ready when zucchini madness starts in July and August. Plus, I’m personally pretty excited for zucchini this year. So far my zucchini plants are growing faster and better than anything else in my backyard garden. Usually my zucchini tanks, so I’ve got high hopes! 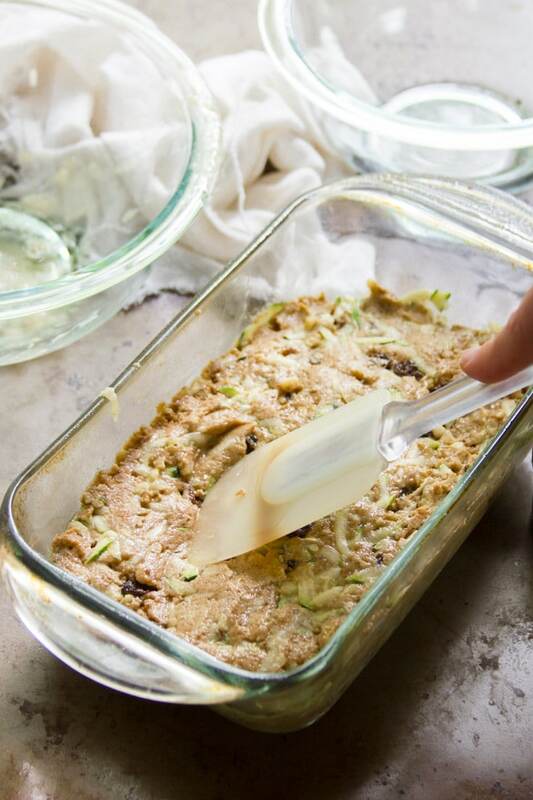 I’m planning for the best outcome and ready with a killer recipe for vegan zucchini bread. This was adapted from my mom’s recipe. She’s had it forever, and when I told her I was working on a vegan zucchini bread recipe, she insisted I base it on hers, because it’s the best. I had to agree with her on that, so I went along with it. I subbed a mashed banana for the eggs in mom’s recipe, which worked out great because (1) bananas make an excellent egg substitute in baked goods like this, and (2) the resulting baked good ends up having a hint of banana bread flavor too, and banana bread is delicious. The banana added a whole new dimension to my old favorite zucchini bread recipe. If you like even more dimension, check out these chocolaty muffins. 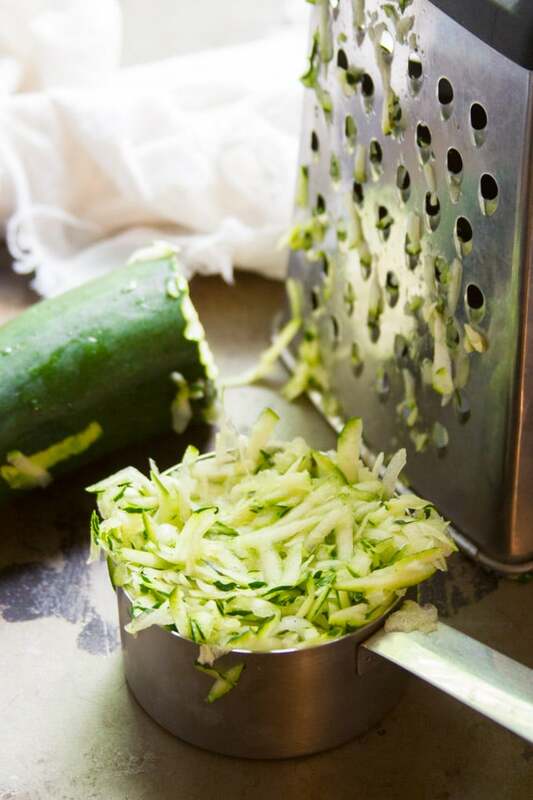 Start by coarsely grating your zucchini. Then mash up your banana using a potato masher or fork. The banana gets mixed up with your liquid ingredients, and your dry ingredients get mixed up in a separate bowl. Add the liquid to the dry and stir just until mixed. 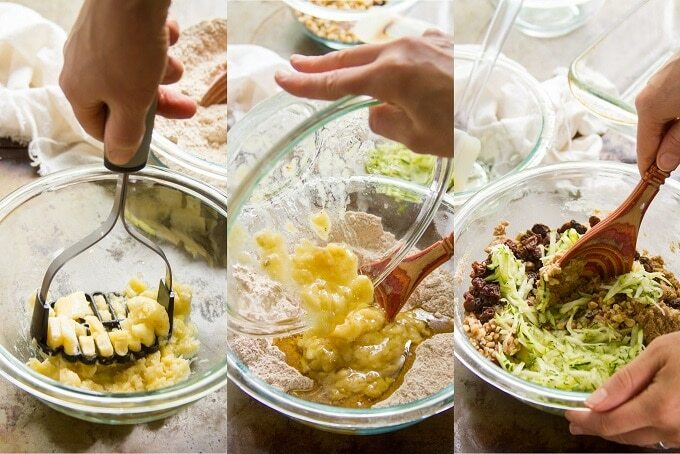 Fold in the zucchini, walnuts and raisins. Transfer everything to a bread pan and bake to perfection. Be careful not to overmix the batter. Just stir until the ingredients are blended, and no more! This will avoid the baking soda fizzing out and the gluten in over-developing, which can make your bread tough. I like to freeze my overripe bananas so I have them on hand all the time for recipes like this. Just be sure to thaw them completely before using, and throw the whole banana into the recipe, including any liquid that’s generated during thawing. Vegan quick breads are always a bit more delicate than non-vegan ones. To avoid crumbling, make sure your bread has cooled 100% before removing it from the pan and slicing it. It also helps to use the right knife when slicing. I always have the best luck with a sandwich knife, but a good quality serrated knife works too. 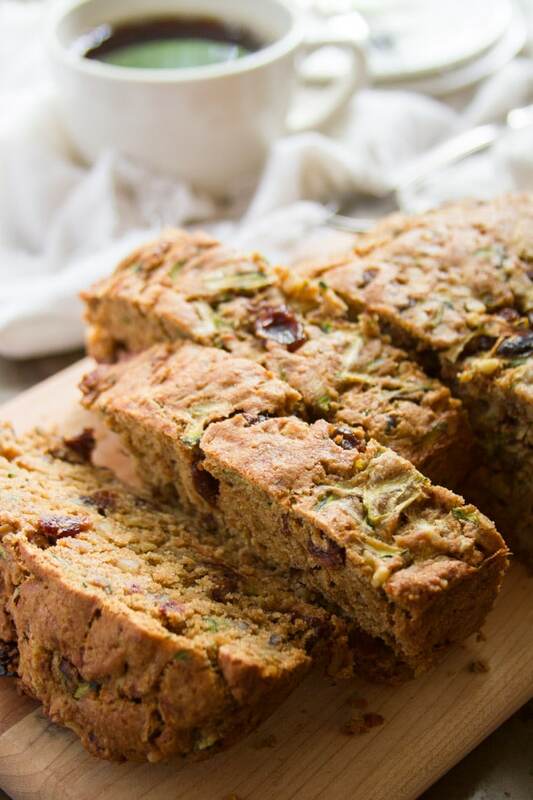 Banana does double duty as an egg replacer while adding sweetness and a touch of flavor to this vegan zucchini bread that's also bursting with juicy raisins, crunchy walnuts and cinnamony sweetness! Lightly oil an 8 or 9 inch loaf pan. Stir the flour, cinnamon, salt, baking soda, and baking powder together in a medium mixing bowl. Place the banana into a separate medium bowl and mash it with a fork or potato masher. Add the sugar, oil, milk and vanilla extract to the banana and stir until well mixed. Add banana mixture to dry ingredients and stir just until blended. Fold in the zucchini, raisins and walnuts. Scoop the mixture into loaf pan and smooth out the top with a spatula. Bake for 50 minutes, or until a toothpick inserted into the center of a loaf comes out clean. Transfer the pan to a cooling rack and allow to cool completely before removing the loaf from the pan and slicing. This sounds great! One question though, my partner is gluten intolerant so what would be the best/easiest sub for the flour? GF all purpose flour? Thanks Rhi! Gluten free all purpose would probably be your best bet, but I haven’t tried it myself so I can’t say for sure. I’m hoping to test some more of my recipes with gluten free blends in the future, but right now my experience with these flours is pretty limited. If you do try this out with a gluten free blend please let me know how it works out! Of course, if I get a chance to test this or any of my other recipes out with gluten free flours I’ll post updates in the notes section of the recipe. I have done a similar type zucchini bread but without sugar and used buckwheat flour as I’m gluten free too , worked fine ! Sounds like a great idea! Thanks Jo! I just made this and it’s amazing! 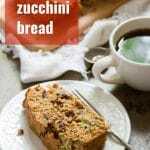 I’m not a huge zucchini fan, but I sure do like it in bread :) Thank you! Thanks for sharing the recipe – your photos are really lovely and I bet the bread tastes so as well. I will definitely try this on my own. I just made this using coconut palm sugar instead of cane sugar, stevia-sweetened chocolate chips (I cannot have cane sugar), and an experimental mixture of coconut, rice bran, and wheat flour. The result was more like a dough than a batter, but it’s so delicious! Tastes like it would make excellent chocolate chip cookies (which I will be testing next time my CSA puts a zucchini in the box). This was amazing and the first vegan baked good that I’ve made so far! Absolutely delicious. I also added organic, unsweetened coconut flakes to the batter and mixed them in with the zucchini and raisins. Turned out wonderfully and I’m thrilled that’s it’s vegan. Thanks for sharing! I’ve made this twice so far, and will continue to do so. I like that there is not a ton of added sugar, and the bread itself is not too sweet. My 10 month old loves this too! Yay! Glad you’re both enjoying it. Thanks Kate! Thank you for this great recipe! The banana adds something different than the usual zucchini bread. I currently have my second batch in the oven, but as muffins instead. I needed it to bake faster this morning! And be a good portable snack for today as I am driving my daughter to an appointment. Thanks again! I’m glad you’re enjoying it! I’ll bet it’s great as muffins too. :) Thanks Stacey!! Just made a double recipe into muffins again today. I didn’t have any almond milk on hand so I just left it out. I didn’t miss it at all. Oh awesome! I’m glad it worked out! Thanks Stacey! How long did you bake the muffins for ? Is the batter supposed to be more doughie than battery? Mine is really stiff. I doubled it but i’m sure I did the right proportions. I want to make this recipe! What size banana did you use? And, did you use the liquid from the grated zucchini? Thank you! Will rice milk work if I don’t have soy or almond? BTW, I have tried quite a few of your recipes with excellent results! Rice milk will work! I’m glad you’re enjoying the recipes! Thanks Lori! This was delicious! Not to sweet. The raisins added just enough sweetness. Also what I really liked about this recipe is that is used regular baking ingredients that I have at home. I didn’t have to go to the store to get random “vegan” stuff to assist in baking. We will make this again! I’m so glad you enjoyed it!! Thanks Laurie! Thanks for the tip about freezing overripe bananas. I know it seems like an obvious thing to do; however, I hadn’t thought of it. One of my girlfriends is up to her ears in zucchini from her garden which means I am too! So I found this recipe and I cannot stop making it! It’s perfect! Thank you! Love this bread so much. All my friends and family love it, too. We grew some massive zucchinis this year, and I’ve now made 5 batches of this recipe. Soooooo good. Love the banana in it, too. Thank you!!! Yay!! I’m so glad it’s a hit! Thanks so much Heather! This is so delicious! I don’t usually have much luck with baking, especially not “healthier” baking, but this bread turned out perfectly. Thanks!!! I used Kirkland dried cherries in place of raisins and pecans instead of walnuts because that’s what I had. Wow! This was very yummy! I made it for my daughter who is vegan, but the entire family liked the bread. That sounds delicious!! I’m so glad it was a hit! Great recipe! I just made this and it was the best zucchini bread I have ever had! Woo hoo! I’m so happy to hear that! Thanks Kaley! 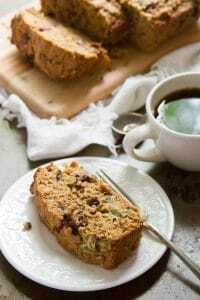 This is my favorite zucchini bread recipe so far, and I’ve tried three. In the last 3 months, I’ve made 7 loaves, it’s that good! My friends and family love it too. I would definitely recommend making this ASAP. Wow!! I’m so glad you love it! Thanks so much Sarah! Could you use coconut milk in place of the other milk? Is there anything I can sub for the banana? I jut really don’t like bananas. 1/4 cup of pumpkin puree might work, but I haven’t tested the recipe with anything but banana, so I can’t be sure.